Systemic sclerosis (SSc) is a connective tissue disease characterized by fibrosis of the skin and organs. Increase in oxidative stress and platelet-derived growth factor receptor (PDGFR) activation promote collagen I (Col I) production, leading to fibrosis in SSc. Lipoic acid (LA) and its active metabolite dihydrolipoic acid (DHLA) are naturally occurring thiols that act as cofactors and antioxidants, and are produced by lipoic acid synthetase (LIAS). The goal of this study was to examine whether LA and LIAS was deficient in SSc patients and determine the effect of DHLA on the phenotype of SSc dermal fibroblasts. N-acetylcysteine (NAC), a commonly used thiol antioxidant, was included as a comparison. Dermal fibroblasts were isolated from healthy subjects and patients with diffuse cutaneous SSc. Matrix metalloproteinase (MMPs), tissue inhibitors of MMPs (TIMP), plasminogen activator inhibitor-1 (PAI-1) and LIAS were measured by ELISA. The expression of Col I was measured by immunofluorescence, hydroxyproline assay, and quantitative PCR. PDGFR phosphorylation and α-smooth muscle actin (α-SMA) was measured by Western blotting. Student’s t-tests were performed for statistical analysis and p-values of less than 0.05 with two-tailed analysis were considered statistically significant. The expression of LA and LIAS in SSc dermal fibroblasts was lower than normal fibroblasts, however LIAS was significantly higher in SSc plasma and appeared to be released from monocytes. 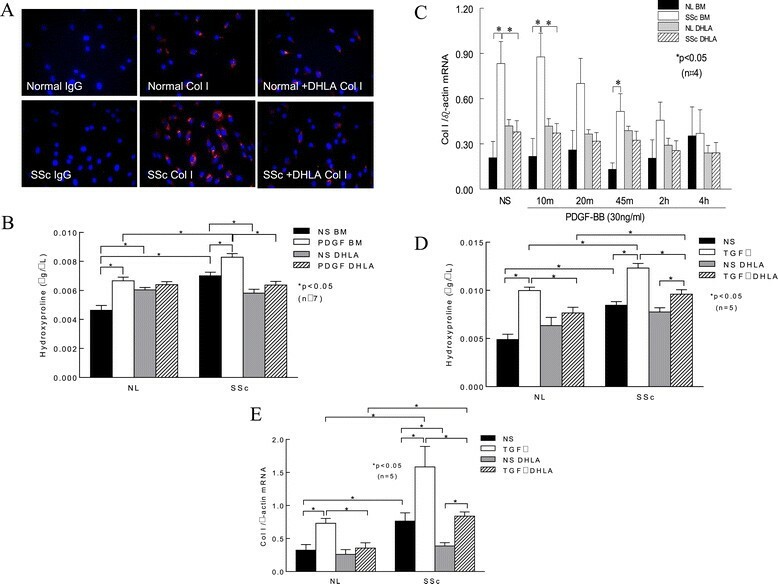 DHLA lowered cellular oxidative stress, and decreased PDGFR phosphorylation, Col I, PAI-1, and α-SMA expression in SSc dermal fibroblasts. It also restored the activities of phosphatases that inactivated the PDGFR. SSc fibroblasts produced lower levels of MMP-1 and 3, and DHLA increased them. In contrast, TIMP-1 levels were higher in SSc but DHLA had minimal effect. Both DHLA and NAC increased MMP-1 activity when SSc cells were stimulated with PDGF. In general, DHLA showed better efficacy than NAC in most cases. DHLA not only acts as an antioxidant but also an antifibrotic since it has the ability to reverse the profibrotic phenotype of SSc dermal fibroblasts. Our study suggests that thiol antioxidants, including NAC and LA/DHLA, could be beneficial for patients with SSc. The pathogenesis of scleroderma (systemic sclerosis, SSc) includes impaired immunity, vascular abnormalities, as well as tissue fibrosis. Despite the effort expended to understand the disease, the mechanism of clinical manifestations of SSc remains elusive. We and others have reported that oxidative stress plays an important role in SSc pathogenesis ,, and a considerable number of clinical studies also reported that oxidative stress is involved in SSc -. Interestingly, SSc sera have the ability to induce reactive oxygen species (ROS) production in endothelial cells and fibroblasts . Allanore et al. reported that plasma markers of oxidative stress, such as protein carbonyls, nitrosothiols, and malondialdehyde were significantly higher in patients with SSc than healthy subjects . In addition, the serum levels of 8-isoprostane, another marker for oxidative stress, were found to be elevated in SSc patients, and correlated with the severity of pulmonary fibrosis, renal vascular damage, and immunological abnormalities . In addition to the increased markers for oxidative stress, studies of decreased antioxidant defense capacity in SSc patients were also reported ,. Several clinical trials were therefore initiated to assess the efficacy of antioxidants in SSc ,-. Calcium channel blockers (dihydropyridines such as nifedipine) significantly lowered ROS and increased plasma thiol levels . The antioxidative property of nifedipine came from its ability to reduce superoxide (O2•−) production from peripheral blood monocytes through the inhibition of protein kinase C (PKC)-dependent protein phosphorylation and PKC activity . A lipid lowering agent/antioxidant, probucol, not only reduced low-density lipoprotein oxidation susceptibility, but also showed significant improvement in Raynaud’s episodes . However, one trial using an antioxidant mixture together with allopurinol failed to show any clinical benefit or improvement in the ROS profile in SSc patients . The incorporation of allopurinol in this study was to reduce free radical production by inhibiting xanthine oxidase. However allopurinol also produces O2•− and this might be one of the reasons for the negative study result. Thiols are an indication for oxidative stress in biological systems, as they are very sensitive to ROS and easily oxidized, and therefore play a crucial role in maintaining the redox state in cells. We showed previously that the free thiol content in SSc dermal fibroblasts was significantly lower than that in normal (NL) cells . It has also been shown that total plasma thiols in SSc patients were significantly lower compared to healthy subjects ,. Glutathione (GSH), the most abundant thiol compound in the body, was significantly lower in erythrocytes and dermal fibroblasts from SSc patients compared to the control population ,. In this study we focused on another crucial thiol, lipoic acid (LA), and its metabolite dihydrolipoic acid (DHLA), in SSc. LA is produced in small amounts by the body via lipoic acid synthetase (LIAS) and acts as the coenzyme for pyruvate dehydrogenase and α-ketoglutarate dehydrogenase in the mitochondria. Together with its reduced form DHLA, it forms a redox couple and the two act synergistically as biological antioxidants when given orally. In addition, they are capable of regenerating GSH, vitamin C and vitamin E from their oxidized forms ,. In contrast to n-acetylcysteine (NAC), a commonly used thiol antioxidant in numerous studies ,-, the LA/DHLA pair appears to provide more benefits as it has a better antioxidative profile and less toxicity. In this study, we were interested in exploring whether LA and LIAS levels were different among healthy subjects and SSc patients, and since DHLA has more antioxidant activity than LA, we examined if DHLA affects the profibrotic phenotype of dermal fibroblasts isolated from patients with diffuse SSc. All SSc patients fulfilled the American College of Rheumatology criteria for classification of SSc . Plasma samples were collected from both SSc patients and healthy subjects. Subject characteristics are listed in Table 1. Two punch biopsies (4 mm) were taken from the forearm of SSc patients with diffuse cutaneous variant. Normal skin tissue was obtained from healthy volunteers as well as the tissue procurement service provided by the University of Michigan Hospital. A written informed consent was obtained for all subjects and the study was approved by the University of Michigan Institutional Review Board. aMean ± SEM; bN.A. = Not applicable; cmRSS = modified Rodnan skin score (0–51); dEarly disease = less than 5 years; eInterstitial lung disease; fPulmonary arterial hypertension. Both NL and SSc dermal fibroblasts were isolated from human skin. The tissue was digested using enzyme digestion solution containing 2.4 units/ml dispase, 650 units/ml type II collagenase, and 10,000 Dornase units/ml DNase. Dermal fibroblasts were maintained in RPMI with 10% fetal bovine serum (FBS), penicillin, and streptomycin. Passages between 4 and 8 were used. Before experiments, NL and SSc dermal fibroblasts were switched to RPMI with 0.1% FBS. When needed, 500 μM DHLA (Santa Cruz Biotechnology) was added to the cell culture media. The incubation time for DHLA ranged from 48–72 hours before the cells were harvested for oxidative stress detection (48 hour) or α-smooth muscle actin (αSMA)/ collagen (Col) analysis (72 hours). Monocytes from both healthy subjects and SSc patients were isolated using Percoll gradient as previously described . They were plated in 6-well plates and the nonadherent cells were washed off after 2 hours of seeding. The adherent cells were monocytes and cultured in RPMI media in the presence of FBS. Before stimulation they were switched to RPMI media without FBS. The conditioned media was collected for LIAS analysis. Cellular O2•− was measured using dihydroethidium (DHE, Invitrogen). The nuclei were stained using 4’,6-diamidino-2-phenylindole (DAPI, Invitrogen). Fluorescence was detected using an Olympus FV-500 confocal microscope and photographs were taken at 400x. Cellular peroxynitrite levels were detected using 2’, 7’-dichlorodihydrofluorescein diacetate . Both NL and SSc dermal fibroblasts were plated in 96-well plates (5 x 104 cells/well, 200 μL/well) and incubated in RPMI (0.1% FBS), with or without 20 mM NAC or 500 μM DHLA for 48 hours at 37°C. After the incubation, cells were then treated with 200 μM 2’, 7’-dichlorohihydrofluorescein diacetate in phosphate buffered saline (PBS) for 1 hour at 37°C. The fluorescence intensity was measured using a fluorescence plate reader and the excitation and emission wavelengths used were 490 and 533 nm. Total RNA was isolated from dermal fibroblasts using RNAeasy miniRNA isolation kits (Qiagen). cDNA was prepared using Verso cDNA synthesis kits (Thermo Scientific). Quantative PCR was performed using SYBR Green PCR master mix (Applied Biosystems), with specific primers for Col I, density-enhanced phosphatase-1 (DEP-1), Src homology-2 domain-containing protein tyrosine phosphatase-2 (SHP-2), and β-actin. All samples were run in duplicate using Applied Biosystems Real-Time PCR System and analyzed using 7500 Applied Biosystems software. Both NL and SSc dermal fibroblasts were incubated with or without 500 μM DHLA overnight and stimulated with platelet-derived growth factor PDGF. Cell lysates were obtained and equal amounts of lysate proteins were incubated with immobilized mouse anti-human phospho- tyrosine monoclonal antibody (Cell Signaling Technology) overnight at 4°C. Rabbit anti-human PDGFRβ antibody (Cell Signaling Technology) was used to probe for phosphorylated PDGFR after SDS-PAGE and Western blotting. The immunoprecipitated tyrosine- phosphorylated proteins were detected using mouse anti- human phospho- tyrosine antibody (Cell Signaling Technology, Danvers, MA). Cells grown in 8-well chambers were fixed and blocked with FBS before probing with mouse anti-human Col I monoclonal antibody (Abcam), rabbit anti-human αSMA antibody (Abcam), or rabbit anti-LA antibody (Calbiochem). Slides were subsequently incubated with Alexa Fluoro donkey anti-mouse antibody or Alexa Fluoro donkey anti-rabbit antibody (Invitrogen). The nuclei were stained using DAPI. Equal amounts of cell lysate were loaded onto polyacrylamide gels and separated by SDS-PAGE. The proteins were then transferred onto nitrocellulose membranes via Western blotting. The blots were probed with antibodies to either LIAS (Thermo Scientific), αSMA (Abcam), or β-actin (Sigma-Aldrich). Phosphatase activity assays were carried out using the DuoSet Intracellular kits from R&D Systems. Antibodies that capture both active and inactive protein tyrosine phosphatase-1B (PTP1B), SHP-2, or DEP-1 were immobilized. After washing away unbound proteins, a synthetic phosphopeptide substrate was added that was dephosphorylated by active phosphatases to generate free phosphate and unphosphorylated peptide. The free phosphate was detected by a sensitive dye-binding assay using malachite green and molybdic acid. By calculating the rate of phosphate release, the activity of the phosphatase was determined. Total matrix metalloproteinase (MMP)-1, MMP-3, tissue inhibitors of MMPs (TIMP)-1, or plasminogen activator inhibitor (PAI)-1 in cell culture medium was measured using ELISA kits from R&D Systems. Briefly, goat anti-human primary antibodies were coated on a 96 plate before the addition of samples and standards. The sandwich ELISA was completed by adding biotinylated goat anti-human antibodies, followed by streptavidine-HRP and substrate solution. The optical density of each well was measured using an ELISA plate reader. Plasma LIAS levels were measured using LIAS ELISA kit from Cusabio Biotech Co. MMP-9 in cell culture media was detected using a SensoLyte Plus 520 MMP-9 assay kit (AnaSpec, Inc). Endogenously active MMP-1 activity in culture media was detected using a SensoLyte Plus MMP-1 assay kit from AnaSpec, Inc.
Hydroxyproline content in cell culture media was measured using a hydroxyproline assay kit (Sigma-Aldrich). Culture media was treated with concentrated hydrochloric acid and hydrolyzed at 120°C for 3 hours. Hydroxyproline standards along with 50 μL of the samples were transferred to a 96 well plate and placed in a 60°C oven until the wells are dried. Chloramine T/Oxidation buffer and diluted 4-(Dimethylamino) benzaldehyde were then added to the wells and incubated for 90 min at 60°C. The absorbance was measured at 560 nm using a plate reader. Results were expressed as mean ± S.E. To determine the differences between the groups, Student’s t-test were performed. P-values of less than 0.05 with two-tailed analysis were considered statistically significant. Since LA is synthesized in the body, we first examined whether LA expression differed in SSc patients. We found that the cellular expression of LA in SSc dermal fibroblasts was lower compared to NL cells (Figure 1A). In addition, the enzyme that produces LA, LIAS, was significantly lower in SSc dermal fibroblasts (Figure 1B). In contrast, the plasma LIAS levels were significantly elevated in SSc patients, specifically those with diffuse SSc or interstitial lung disease (ILD), compared to healthy subjects (Figure 1C). Patients with limited SSc or pulmonary hypertension showed no difference in LIAS levels. To determine the source of the released LIAS levels detected in plasma, we measured LIAS in conditioned media collected from dermal fibroblasts, dermal endothelial cells, as well as monocytes from both healthy subjects and SSc patients. Only the culture media from monocytes released detectable LIAS levels. Although no statistical significance was reached between NL and SSc groups, there was significant difference between NL and diffuse SSc (p < 0.05, Figure 1D). Similar to what was seen in the plasma (Figure 1C), monocytes from limited SSc patients did not produce elevated amounts of LIAS (p < 0.05 between diffuse and limited SSc, Figure 1D). The levels of LA, LIAS and oxidative stress in NL and SSc fibroblasts and plasma. A) Immunostaining of LA in NL and SSc dermal fibroblasts (n = 3 subjects). B) The expression of LIAS in dermal fibroblasts was examined by Western blotting (6 NL and 5 SSc subjects). C) Plasma LIAS levels in healthy subjects or SSc patients. D) LIAS levels in culture media from monocytes isolated from healthy subjects or SSc patients. E) Cellular O2•− levels were detected by DHE. These representative images were from 5 NL and 5 SSc subjects. F) The effect of DHLA or NAC on peroxynitrite levels was measured (n = 4 subjects, p < 0.05). Results are expressed as mean ± S.E. and p < 0.05 was considered significant. Since LA and its metabolite DHLA can act as antioxidants, we examined their antioxidative capacity in dermal fibroblasts. We found that superoxide was significantly higher in SSc dermal fibroblasts (Figure 1E), and DHLA had no effect. To examine whether DHLA affects other oxidative products, we measured peroxynitrite and showed that it was elevated in SSc dermal fibroblasts. NAC and DHLA lowered it significantly (Figure 1F). This suggests that there is increased oxidative stress in SSc dermal fibroblasts, and different thiols affect different forms of oxidative products. Since LA was lower in SSc dermal fibroblasts and it relieved oxidative stress, we hypothesized that adding DHLA, its active metabolite, to the cells would change their profibrotic phenotype back to normal. We first examined the effect of DHLA on PDGFR activation. In NL dermal fibroblasts, PDGF-stimulated PDGFR phosphorylation (p-PDGFR) was maximal at 30 min and decreased significantly at 1 hr (Figure 2A). In contrast, p-PDGFR maximized at 10 min and remained phosphorylated at 1 hr in SSc dermal fibroblasts. In the presence of DHLA, p-PDGFR occurred at 10 and 30 min for NL fibroblasts. However, PDGF did not induce p-PDGFR in the presence of DHLA in SSc fibroblasts. Comparing the time course of p-PDGFR with or without DHLA, it significantly decreased the extent of p-PDGFR in both NL and SSc. This suggests that the excessive p-PDGFR seen in SSc dermal fibroblasts is due to increased oxidative stress, as a thiol antioxidant could reduce it. The effect of DHLA on the PDGFR pathway and phosphatases. A) p-PDGFR after PDGF stimulation at various time points. n = 3 NL and SSc subjects. Enzymatic activities of PTP1B (B), SHP-2 (C), and DEP-1 (D) in fibroblasts with or without DHLA or NAC. Results are expressed as mean ± S.E. and p < 0.05 was considered significant. Since DHLA affects p-PDGFR, we hypothesize that by decreasing the oxidative stress in SSc dermal fibroblasts, DHLA restores the activities of thiol-sensitive phosphatases, therefore decreasing p-PDGFR. Since PTP-1B, DEP-1, and SHP-2 have been shown to dephosphorylate the PDGFR, we examined their expression and activities with or without DHLA in NL and SSc fibroblasts. SHP-2 mRNA was significantly lower in SSc (Additional file 1: Figure S1), and the presence of the antioxidants increased it, with NAC reaching statistical significance. On the other hand, DEP-1 mRNA was significantly higher in SSc dermal fibroblasts compared to NLs while the thiol antioxidants did not affect the mRNA levels. Interestingly, DEP-1 protein expression was elevated in SSc fibroblasts under basal conditions, and addition of NAC further increased it in both NL and SSc cells (data not shown). We found that PTP1B was significantly inactivated in SSc dermal fibroblasts (Figure 2B). The addition of thiols significantly restored PTP1B activity. Similarly, SHP-2 activity was significantly lower in SSc dermal fibroblasts (Figure 2C). While addition of NAC had no effect on SHP-2 activity, DHLA significantly restored it in SSc fibroblasts. On the other hand, DEP-1 activity was similar in NL and SSc fibroblasts, however, addition of antioxidants increased DEP-1 activity in SSc dermal fibroblasts (Figure 2D). DHLA was more effective than NAC, as it caused a significant increase in DEP-1 activity in SSc cells compared to that at basal level. Taken together, these results imply that the increased oxidative stress in SSc inactivates phosphatases responsible for PDGFR dephosphorylation, resulting in increased p-PDGFR. The presence of antioxidants not only eliminates oxidative substances, but also restores phosphatase activities, therefore decreasing the extent of p-PDGFR. Since PDGFR activation can lead to excess Col I production, we hypothesize that DHLA can decrease Col I in these cells. As expected, there was more Col I staining in SSc dermal fibroblasts compared to NLs (Figure 3A). In the presence of DHLA, Col I in SSc dermal fibroblasts decreased to similar levels that were observed in NL cells. To further quantify the levels of Col I, we measured hydroxyproline in the cell culture media in the presence or absence of DHLA (Figure 3B). Similar to what was observed in Figure 3A, hydroxyproline was significantly higher in SSc than in NL and addition of DHLA decreased it. Stimulating the cells with PDGF induced hydroxyproline levels significantly in both NL and SSc fibroblasts while DHLA diminished its effect (Figure 3B). We also determined the effect of DHLA at the mRNA levels. At basal level, 10 and 45 min after PDGF stimulation, Col I mRNA was significantly higher in SSc fibroblasts (Figure 3C). After 4 hr of PDGF stimulation, Col I mRNA significantly decreased compared to NS. DHLA significantly decreased Col I mRNA levels in SSc fibroblasts at basal levels and 10 min after PDGF incubation. These results indicate that in SSc, enhanced PDGFR activation leads to more Col I synthesis. By acting on scavenging ROS and deactivating the PDGFR, DHLA decreased Col I production. The expression of Col I in fibroblasts. A) Immunostaining of Col I in NL and SSc dermal fibroblasts (3 NL and 4 SSc subjects). B) Hydroxyproline content was measured in cell culture media. 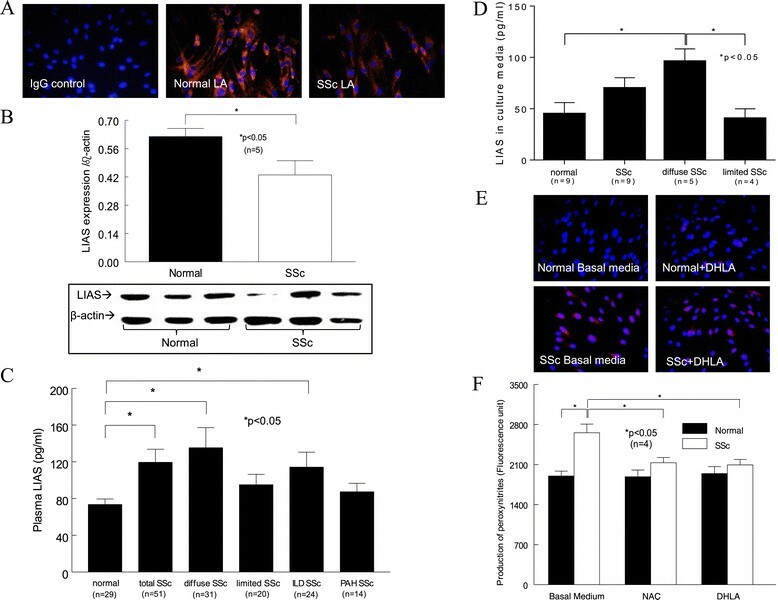 Similar to Figure 3A, hydroxyproline levels were elevated in SSc dermal fibroblasts compared to NL cells. PDGF significantly increased hydroxyproline in both NL and SSc cells. Addition of DHLA significantly reduced hydroxyproline in both NL and SSc cells. C) Col I mRNA levels with or without PDGF stimulation at various time points. D) The effect of TGF- β on hydroxyproline levels were examined. TGF- β significantly increased hydroxyproline levels in both NL and SSc dermal fibroblasts, while DHLA decreased it. E) TGF- β induced Col I mRNA levels in both NL and SSc fibroblasts, and DHLA decreased them significantly. Results are expressed as mean ± S.E. and p < 0.05 was considered significant. NL: normal; BM: basal medium; NS: non-stimulated. To further investigate the effect of DHLA on transforming growth factor (TGF)-β, both NL and SSc dermal fibroblasts were incubated with 10 ng/ml TGF-β for 48 hrs and Col I production was examined by both qPCR and hydroxyproline content. In healthy fibroblasts, the addition of TGF-β significantly increased the hydroxyproline content (Figure 3D). In contrast, the presence of DHLA significantly decreased it. 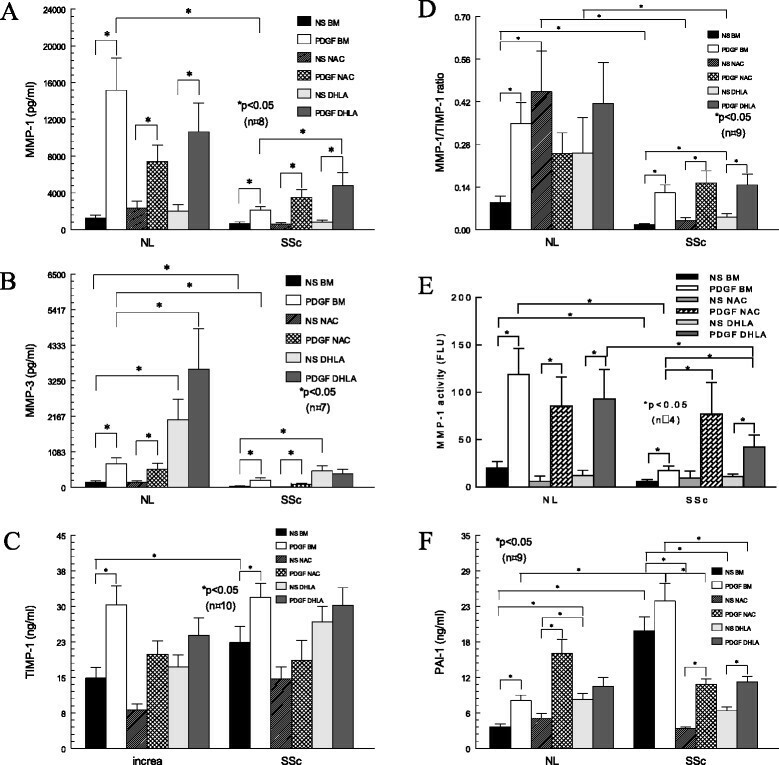 Hydroxyproline levels were significantly elevated in conditioned media from SSc dermal fibroblasts compared to NL, and increased significantly after TGF-β incubation. Although the addition of DHLA significantly reduced hydroxyproline levels in SSc cells, the amount of hydroxyproline was still significantly higher compared to that in NL fibroblasts. The mRNA levels of Col I was also examined after cells were treated with TGF-β (Figure 3E). Similar to Figure 3D, Col 1 mRNA levels were significantly elevated in SSc dermal fibroblasts compared to NL cells. TGF-β induced Col I mRNA in both NL and SSc dermal fibroblasts, and the presence of DHLA reduced the levels. These results suggest that DHLA not only affects PDGF-induced Col I production, but also acts on TGF-β-mediated fibrosis processes. To further examine the effect of thiols on Col I degradation, MMP-1 in cell culture medium were determined (Figure 4A). MMP-1 increased significantly after PDGF stimulation in both NL and SSc fibroblasts. In addition, PDGF-stimulated MMP-1 levels were significantly lower in SSc dermal fibroblasts, which could also contribute to the increased Col I expression seen in these cells. Thiols did not alter MMP-1 significantly in NLs, however, they did increase MMP-1 in SSc cells stimulated with PDGF. In particular, the presence of DHLA resulted in a significant increase in PDGF-stimulated MMP-1 levels in SSc. The expression of MMP-1, 3, TIMP-1, ratio of MMP-1/TIMP-1, MMP-1 activity, and PAI-1 in fibroblasts. A) MMP-1 released into cell culture media after PDGF, DHLA, and/or NAC incubation. B) MMP-3 released into cell culture media after PDGF, DHLA, and/or NAC incubation. C) TIMP-1 in cell culture media after PDGF, DHLA, and/or NAC incubation. D) The MMP-1/TIMP-1 ratio in NL and SSc dermal fibroblasts. E) MMP-1 activity was significantly higher in NL dermal fibroblasts compared to SSc cells. PDGF significantly increased MMP-1 activity in both NL and SSc cells. Both DHLA and NAC appeared to increase MMP-1 activity significantly in SSc dermal fibroblasts when stimulated by PDGF. F) PAI-1 released from both NL and SSc dermal fibroblasts in the presence of PDGF. Results are expressed as mean ± S.E. and p < 0.05 was considered significant. NL: normal; BM: basal medium; NS: non-stimulated. Since MMP-3 converts pro-MMP-1 and 9 into their active forms, we also measured MMP-3 and 9 levels (Figure 4B). Similar to MMP-1, PDGF stimulated MMP-3 production in both NL and SSc. In addition, MMP-3 was significantly lower in SSc fibroblasts under basal conditions. NAC did not appear to have any effect on MMP-3, but DHLA increased MMP-3 significantly in both NL and SSc cells. The lack of MMP-3 to activate MMP-1 may exacerbate the accumulation of Col I in SSc dermal fibroblasts. MMP-9 was significantly lower in SSc culture medium. Unlike MMP-1 and 3, the antioxidants did not affect MMP-9, nor did PDGF show a consistent effect on its production (data not shown). Similarly the antioxidants did not affect TIMP-1 levels (Figure 4C). Although TIMP-1 was elevated in SSc dermal fibroblasts, the MMP-1/TIMP-1 ratio was significantly lower in SSc fibroblasts, suggesting a shift that favors a profibrotic phenotype in these cells (Figure 4D). 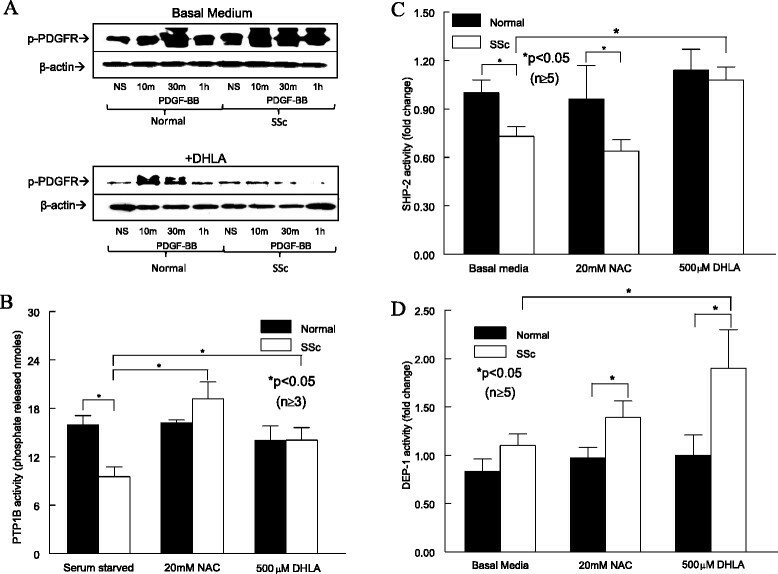 DHLA, but not NAC, increased the ratio significantly, suggesting additional beneficial effects of DHLA on these cells. To determine whether thiol antioxidants affect MMP-1 activity, we measured endogeneous MMP-1 activity in cell culture media. MMP-1 activity was significantly higher in NL cells compared to SSc dermal fibroblasts with or without PDGF stimulation (Figure 4E). Neither NAC nor DHLA had an effect on MMP-1 activity in NL cells. In SSc dermal fibroblasts, Both DHLA and NAC increased MMP-1 activity significantly. The levels of PAI-1, an inhibitor for urokinase/tissue type plasminogen activator which contributes to Col degradation, were also examined (Figure 4F). PAI-1 released from SSc fibroblasts was significantly higher while the thiols significantly reduced it. Taken together, it is possible that DHLA decreases Col I through decreasing PAI-1 and increasing MMPs. To examine whether DHLA affects the myofibroblast phenotype in SSc, we examined αSMA expression. 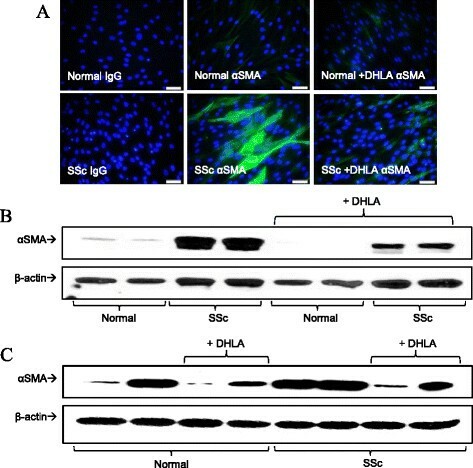 The expression of αSMA was markedly elevated in SSc dermal fibroblasts, and DHLA reduced it (Figure 5A and B). In addition, we examined the effect of DHLA on TGF-β stimulated fibroblasts. As shown in Figure 5C, TGF-β induced αSMA expression in both NL and SSc fibroblasts while adding DHLA to the culture decreased its expression. The expression of αSMA in fibroblasts. A) The immunofluorescent staining of αSMA (n = 3 subjects). B) Western blotting showed similar results observed in A (n = 4 subjects). C) Effect of DHLA on TGF-β-stimulated dermal fibroblasts from healthy and SSc subjects. In this study we showed that the thiol antioxidant DHLA not only decreased cellular peroxynitrites, but also reduced p-PDGFR, which is potentially due to its effect on the phosphatases that are involved in this pathway. Col I, αSMA, and PAI-1 decreased after DHLA treatment, while MMP-1 and MMP-3 increased. In addition, DHLA increased MMP-1 activity. It also decreased the ability of TGF-β to induce Col I and αSMA expression in fibroblasts. The beneficial effect of DHLA might also be due to replenishing the anti-oxidative capacity in SSc dermal fibroblasts. NAC is used as an antioxidant and its effect in SSc has been examined in various studies ,,-. Considering the low oral bioavailability of NAC, which could partially explain its limited therapeutic efficacy in clinical trials, the introduction of another thiol antioxidant with a much better absorption profile to treat SSc is an intriguing strategy. LA/DHLA are soluble in both lipid and aqueous environments. Because of this, LA has better bioavailability than NAC; the bioavailabilities of 200 mg of LA and NAC were estimated to be 38% and 4% ,. Since DHLA has more reducing activity than LA, it was chosen for our study. We were able to use lower amounts of DHLA and achieve the same effect, in some cases, better efficacy, than NAC. We attempted to measure plasma LA/DHLA using liquid chromatography-mass spectrometry but they fell below the detection limit. Instead we immunostained fibroblasts and showed that LA in SSc was lower. We should note that the plasma levels of LA and DHLA in healthy subjects have been reported to be approximately 30 ng/ml (i.e. 150 nM) and 175 ng/ml (0.84 nM) ,, a lot lower comparing to GSH (3.39 ± 1.04 μM ), which is the predominant form of cellular thiol. In a separate study, the plasma GSH content in SSc patients was significantly lower than in healthy controls: 170 ± 44 vs. 246 ± 46 μmol/g hemoglobin . Although DHLA and LA are lower in abundance, their reduction potential is more negative than that of GSH and its oxidized form (−320 mV vs. -240 mV), suggesting that DHLA can regenerate GSH and maintain the ratio between GSH and it oxidized form GSSG in cells ,. Moreover, due to their amphipathic nature and smaller molecular sizes compared to GSH, the DHLA/LA pair moves freely in both cytosol and lipid compartments and are readily accessible to more proteins and enzymes that are affected by redox signaling. Therefore LA and DHLA, whether endogenously or given externally, are indeed important in maintaining cellular function. We also examined LIAS, a crucial enzyme involved in the LA synthetic pathway. The significantly lower LIAS in SSc fibroblasts might explain the lower LA levels in these cells. However plasma LIAS was significantly elevated in patients with diffuse SSc. The reason for the discrepancy is not clear. Nonetheless we were able to determine the source of the LIAS by measuring LIAS in culture media from dermal fibroblasts, endothelial cells, and monocytes. It appears that only monocytes from both NL and SSc patients released detectable amounts of LIAS (Figure 1D). Similar to what we saw in the plasma, monocytes from diffuse patients produced elevated amounts of LIAS compared to healthy subjects, while those from limited SSc patients did not. Interestingly we could not detect LIAS from monocytes isolated from patients with rheumatoid arthritis (data not shown). The mechanism of LIAS release in different disease setting appears to be a complicated process and remains to be explored. It is worth noting that 8-isoprostane, an oxidized lipid, was also found to be elevated in plasma obtained from patients with diffuse SSc or ILD (data not shown). It is possible that LIAS is being produced and released from circulating immune cells to counteract the increased oxidative stress observed in SSc patients. In recent years, the use of LA/DHLA has evolved from antioxidants to antifibrotics. LA protected against bleomycin-induced lung injury by suppressing ROS and improving the MMP-1/TIMP-1 ratio . Treatment with LA also attenuated cardiac fibrosis in rats . In a diabetic model, LA not only decreased oxidative damage, Col I, and αSMA expression in the heart, but also increased MMP-2 activity . In addition, LA inhibited the development of thioacetamide-induced liver fibrosis in rats . In a hepatic fibrosis mouse model, LA inhibited the expression of Col I, αSMA, and PAI-1 . Our study adds SSc skin fibrosis to the fibrotic diseases that have been shown to be affected by LA/DHLA. In SSc, fibroblasts differentiate into myofibroblasts, a process characterized by excess production of αSMA. The mechanism of DHLA lowering αSMA expression in our study is not known. However, it has been shown that LA treatment decreased the expression of TGF-β , and affected the redox-sensitive transcription factors AP1 and sp1 . In addition, it decreased connective tissue growth factor . In hepatic stellate cells, DHLA inhibited TGF-β/PDGF activation through the interruption of ROS-related PI3K/AKT and MAPK signaling . Similar results were observed in kidney cells, where mesangial cell transformation into myofibroblasts was completely prevented by LA . The authors showed that LA inhibited the PDGF-activated ERK1/2 pathway, suggesting the increased expression of αSMA in cultured mesangial cells could be modulated by redox-sensitive signal pathways. Tissue fibrosis occurs when extracellular matrix (ECM) turnover favors production of collagen and other ECM proteins over degradation. Therefore in this study, in addition to the activation of Col I synthesis (i.e. p-PDGFR), we also examined the key factors that degrade Col I. MMPs are major proteolytic enzymes involved in degrading and remodeling the ECM. MMP-1 derived from fibroblasts is known to degrade Col I and other collagens. MMP-3 has a broad spectrum of proteolytic activity including degradation of collagen. Furthermore, MMP-3 is required for maximal activation of proMMP-1 and 9. In contrast, TIMP-1 and PAI-1 are natural inhibitors of MMPs or plasmin, thereby inhibiting ECM degradation. In agreement with other studies -, we found that MMP-1, 3, and 9 release by SSc dermal fibroblasts was significantly lower, and that TIMP-1 and PAI-1 were elevated. DHLA was able to increase both MMP-1 and MMP-3 levels released from SSc fibroblasts. Although it had minimal effect on TIMP-1, the MMP-1/TIMP-1 ratio increased significantly after DHLA treatment, shifting these SSc cells from a pro-fibrotic state to a relatively anti-fibrotic state. Moreover, DHLA not only increased the expression of MMP-1, it also increased MMP-1 activity after PDGF stimulation in SSc dermal fibroblasts. This suggests that DHLA can alter pathogenic processes that are important in SSc. The expression of MMP is regulated by NFkB  and also oxidative stress ,, therefore the presence of antioxidants can alter the expression of MMPs. In our hands, the incubation of thiol antioxidants increased the expression of MMP-1 and 3 (Figure 4). However, MMP-9 expression was not altered by the thiols. It appears that the expression of MMP-9 is regulated by NFkB, AP-1, and the p38 MAPK pathway - and that LA inhibits MMP-9 expression by inactivating NFkB . The involvement of these other pathways (AP-1 and p38) tightly regulates the MMP-9 expression and this could be the reason for the ineffectiveness of the thiols used. On the other hand, TIMP-1 expression can be stimulated by a variety of agents including serum, growth factors, cytokines, and viruses ,. Regulation of TIMP-1 expression involves the activation of transcription factors including AP-1, Sp1, STAT, and Pea3/Ets families, as well as signaling pathways such as the ERK1/2 pathway -. Similar to MMP-9, the complex regulation of TIMP-1 expression makes it difficult to render its expression, hence in our hands the use of thiol antioxidants did not affect TIMP-1 levels in normal and SSc dermal fibroblasts. What could be the possible mechanism by which the thiols affect the expression of the phosphatases examined in this study? Transcription factors, such as NFkB and AP-1, are regulated by the intracellular redox state. They are implicated to be involved in the regulation of expression of a variety of genes . It has been shown that LA/DHLA and NAC inhibit the NFkB pathway -. NAC also inhibits AP-1 activation , while the role of LA/DHLA on this pathway is unclear. It is possible that the thiol antioxidants control the expression of phosphatases through these redox-sensitive transcription factors. Moreover, the expression of phosphatases can be affected by oxidative stress . The exact mechanism by which the antioxidants increase SHP-2 and DEP-1 expression will require further investigation. The PTP family is characterized by their signature motif at their active site, HC(X)5R. It contains an essential cysteine residue that has a low pKa that is susceptible to oxidation. Its ability to be oxidized reversibly acts as a redox regulatory mechanism for receptor tyrosine kinases to control their phosphorylation state. We and others have shown that when excessive oxidative stress is present, the cysteine group is oxidized and the activity is inactivated ,,. We also reported that PTP1B was oxidized and subsequently inactivated in SSc dermal fibroblasts . This led to prolonged p-PDGFR and increased Col I. Treatment with NAC restored the activity and decreased p-PDGFR and Col I. In this study DHLA showed a similar effect. In addition to PTP1B, we examined two other thiol-sensitive phosphatases that regulate p-PDGFR. Similar to PTP1B, these phosphatases have a cysteine residue at their active site that is required for their phosphatase activity. As shown in Figure 2, DHLA increased activities of all three phosphatases in SSc fibroblasts. This is superior to NAC, since NAC had no effect on DEP-1 and SHP-2 activity. It has been shown that thiol antioxidants are able to regenerate enzyme –SH groups and restore the phosphatase activities ,,. Therefore the mechanism of DHLA to restore the enzyme activity is through reduction of the oxidized cysteine group at the active site. Note that the catalytic activities of these phosphatases are tightly regulated and that subcellular localization can also affect substrate specificity. In other words, the active site may have different susceptibility towards different thiol antioxidants. In addition, the antioxidant capacity of the thiols used in this study is different (the pKa at the thiol group differs) giving them different catalytic activity towards the possible different oxidation products (−SOH, −SO2H, −SSR, etc.) at the phosphatase active sites ,. Moreover, since the bioavailability of NAC is lower than LA/DHLA, and LA/DHLA has more desirable structural properties that allow it to move freely in cellular compartments, it could reach a higher concentration intracellularly and hence be more accessible at the enzyme active site compared to NAC. We speculate that these are the reasons NAC has no effect on SHP-2 activity (Figure 2C), but DHLA does. Nonetheless, the increase in these phosphatase activities provides a potential mechanism for reducing p-PDGFR in SSc dermal fibroblasts. This is the first report to show that LA and LIAS are lower in SSc dermal fibroblasts. In addition, DHLA was able to reverse the profibrotic phenotype of these cells by decreasing p-PDGFR, restoring the activities of phosphatases, lowering PAI-1, and increasing both MMP-1 and MMP-3 expression as well as MMP-1 activity. Moreover, DHLA lowered the expression of αSMA, suggesting that it could reverse the myofibroblast differentiation of SSc dermal fibroblasts. Hence thiol antioxidants, in particular LA/DHLA, could prove to be an effective treatment in SSc. All authors agree to be accountable for all aspects of the work. PT: conception and design, data collection and analysis, manuscript writing and final approval of the manuscript. BB, AP, AL, MA, WS, and GZ: data collection and analysis, critical revision and final approval of the manuscript. DK, ES, DF, and AEK: analysis and interpretation of the data, critical revision and final approval of the manuscript. All authors read and approved the final manuscript. This work was supported by the Scleroderma Foundation (to A.E.K. ), the Office of Research and Development, Medical Research Service, Department of Veterans Affairs, the Frederick G. L. Huetwell and William D. Robinson, MD, Professorship in Rheumatology, NIH/NIAMS K24 AR063120-02 (to D. K.), the Arthritis Foundation (to P. T.), the clinical research unit at the University of Michigan, the Linda Dolce Scleroderma Research Fund, the Marvin and Betty Danto and the Jonathan and Lisa Rye Endowments for Scleroderma Research at the University of Michigan, and in part by the Tissue Procurement Core of the University of Michigan Comprehensive Cancer Center (CA46952).